Throughout the Bible, understanding the meaning of names of important people and places is often crucial to understanding the message of the ancient authors. In other words, names of people and places serve as “key-words” that can help unlock the intended messages of scripture. Since the Book of Mormon is an ancient record rooted in Old Testament traditions, it is not surprising that similar patterns of wordplay emerge from its pages. Besides their important role as key-words in scriptural interpretation, the names of people and places may also provide our clearest glimpses into the text that existed on the plates from which Joseph Smith translated the Book of Mormon. 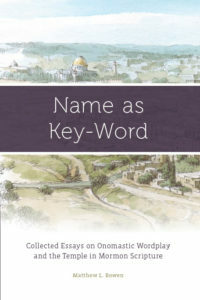 In many instances, the names of important Book of Mormon people and places are directly related to words matching the most-likely Hebrew and Egyptian origins for those names. Textual and contextual clues suggest that this matching was done deliberately in order to enhance literary beauty and as an aid to understanding. In some cases, authorial wordplay can be verified by a close analysis of matching text structures. In others, the wordplay can be verified by using the Bible as a “control” text. A wealth of philological, onomastic, and textual evidence suggests that the Book of Mormon, like the Bible, is the work of ancient authors rather than that of a rural nineteenth-century man of limited literary attainments. Knowing more about these names enriches our understanding of the stories that these authors tell.